South Korea’s President Moon Jae-in says he would be willing to hold talks with North Korea’s leader Kim Jong-un under the right conditions. Moon made the offer as he spoke to reporters Wednesday one day after diplomats from the two sides met for 11 hours in their first official talks since 2015. Negotiators met at the “peace village” of Panmunjom on the border between the Koreas. It is unclear whether a meeting between the two Korean leaders could take place anytime soon. North Korea’s Kim Jong Un has not met with any foreign leaders since he took power in 2011. Koh Yu-hwan is a North Korea expert at Dongguk University in Seoul. He said such a meeting is possible during Moon’s five-year term. “Kim has never met any foreign leader, so it would be meaningful for him to make his first summit a meeting between [the] Koreas,” he said. Moon said he was open to any form of meeting with some conditions. He noted talks should not be empty. During last year’s presidential campaign, Moon said that he wanted to improve relations between the Koreas. However, he also has supported strong international restrictions on the North to bring it to the negotiating table. 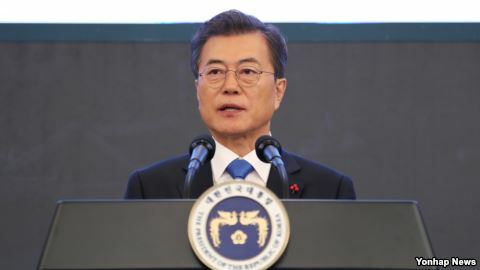 The South Korean president noted on Wednesday that U.S. President Donald Trump was important in helping to bring about conditions that permitted the negotiations. He said Trump deserved “big credit” for increasing pressure through sanctions on the North Korean leadership. U.S. President Donald Trump and President Moon Jae-In spoke by phone earlier, before talks were held in Panmunjom. In Washington, U.S. President Donald Trump agreed during a Cabinet meeting on Wednesday. “Without our attitude that would have never happened,” Trump said. The two Koreas have agreed to reopen an emergency communications hotline. They also agreed to hold military talks to solve disputes and avoid accidental conflict. North Korea said it would send a large delegation to the Pyeongchang Winter Olympics next month. And South Korea said it would be willing to suspend some restrictions that could interfere with North Korea attending the Games. South Korea also proposed a reunion of families separated by the Korean War to be held some time in February. Moon called North Korea’s attendance at the Olympic Games “very desirable.” However, he said progress on the nuclear issue is necessary for relations between the Koreas to improve. He warned that new nuclear or missile tests would only increase international pressure. Grant Newsham is with the Japan Forum for Strategic Studies based in Tokyo. He said it is important that the militaries of the two sides are talking to each other. But he warns that North Korea could use the talks to divide South Korea from its allies, Japan and the U.S.
Mario Ritter adapted this story for VOA Learning English based on reporting from Brian Padden of VOA and the Associated Press. Hai Do was the editor.